NotMyIP is a free proxy tool that helps overcome censorship and provides ability to user to browse anonymously on Internet by hiding the actual IP address, much like the popular Hide IP. NotMyIP (or Not My IP) is freeware version of premium product Anonymity Gateway and uses only high quality proxies. Anonymous gateway provided by NotMyIP can also be used to bypass access restriction, such as blocked MySpace access, blocked Facebook access, or even use to bypass RapidShare, MegaUpload and other file sharing services download limit. By using NotMyIP, all outgoing and incoming traffic will be routed through NotMyIP proxies, effectively using another IP address for surfing Internet. The unique features of NotMyIP is that it does not require manual configuration or additional plug-ins or add-ons, and automatically works with all web browsers, including Internet Explorer, Firefox, Opera and Google Chrome. Best of all, NotMyIP comes equipped with premium high quality and high speed proxies that ensure the proxy routing is working properly, instead of having user to search the Internet for new proxies every now and then. 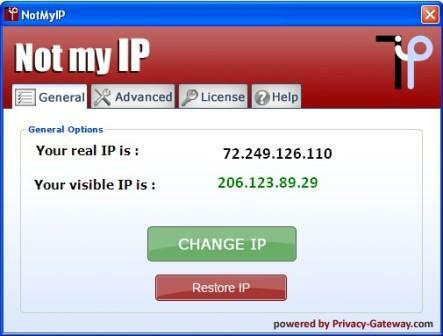 For freeware NotMyIP, there is 3 premium US proxies with 3 different IP addresses available for free usage. NotMyIP is currently in version 1.1 with face lift with some bug fixes. However, with all users of NotMyIP sharing the probably same proxies, you can guess that the browsing speed will be on the slower side.